It was disappointingly wet when I got to Sidings. It was just starting to rain. I sheltered in the doorway waiting, when along came Malcolm. We established that we were both willing to risk cycling down to Regents Park in the hope that it would brighten up as had been forecast. 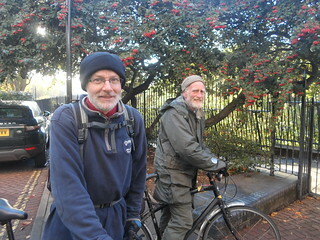 At Regents Park we met James, the leader, and Chris and had a warming cup of tea while we waited for any latecomers. James had received messages saying one other person was coming. James explained that, although I had done the route with him before, it would be different as it would be in reverse order. 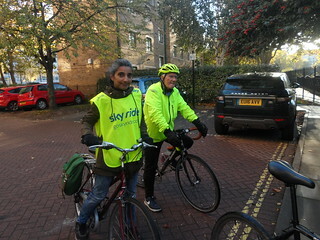 Shanaz arrived soon after and after she’d also drunk a warming cuppa, we set off back up the Broadwalk and then eastward down towards Euston and then through Lincoln’s Inn, stopping for a quick comfort break, then across Fleet Street down to CS2, the east-west cycle route along the Embankment. By now the sun was shining and we were getting warmer and enjoying the ride very much. We cycled past the iconic sights of Westminster and the Southbank, turned right at Westminster Bridge and through St James Park along Birdcage Walk, through Victoria and Pimlico to come out onto the Embankment again and crossed the river at Chelsea Bridge. Although we’d passed through many squares with gardens Battersea Park was the first actual park since Regents Park. We stopped in Battersea Park for refreshment and a quick view of the Pagoda and the representations of Buddha. 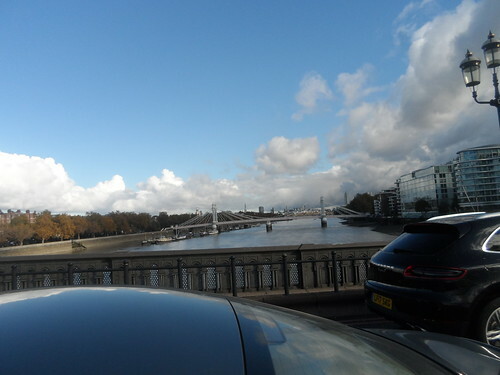 Off we set again, this time westward, and crossed back over the river on Albert Bridge and headed towards Chelsea. 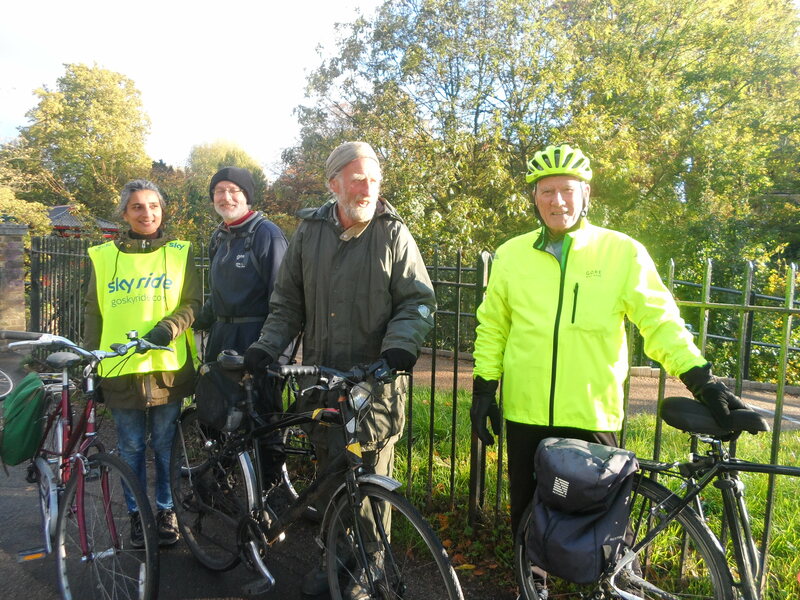 The second ‘park’ was actually Brompton Cemetary which we cycled through and negotiated back streets through Earls Court and headed north to Kensington and Holland Park. This was the first park where there was a cafe where we could sit and have a meal inside. We spent an hour at Holland Park Cafe, eating, chewing the fat and enjoying each other’s company. 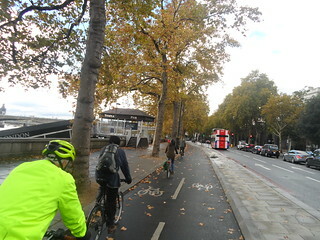 From there it’s a short ride and walk through to Kensington Gardens. 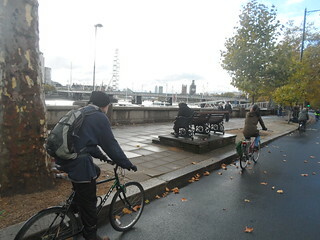 Here we took paths that I didn’t realise were cycle paths which go east-west rather than north-south like the Broadwalk. 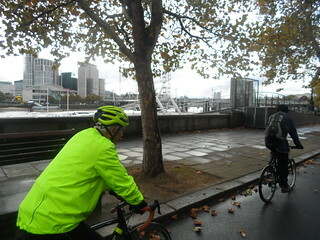 The weather looked rather threatening so we headed for a refreshment kiosk and sheltered there when the heavens opened. The provided an excuse (as if one were needed) for a warming cuppa and a snack. 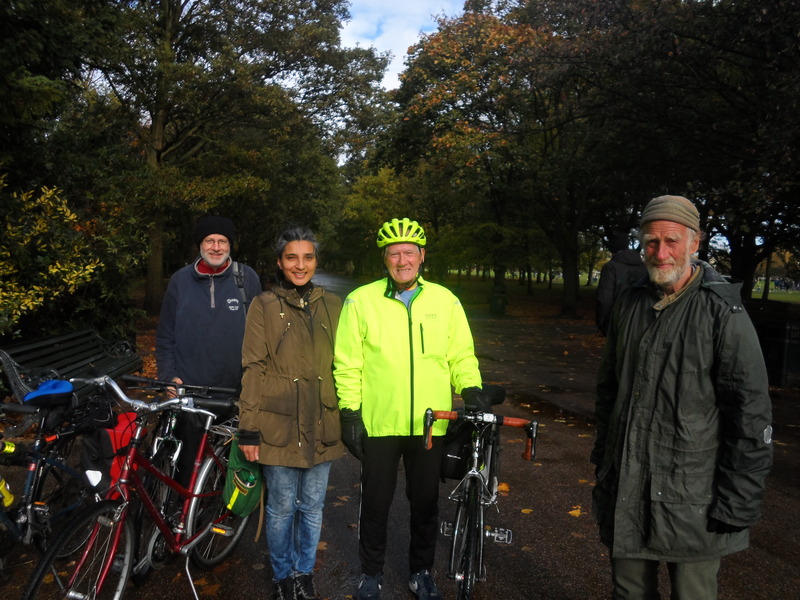 After the brief but heavy shower of hail we moved on across Hyde Park to Hyde Park Corner and turned north following the cycle path parallel to Park Lane. At Marble Arch we observed a large protest march. It was difficult to establish what it was for As the language was Arabic. 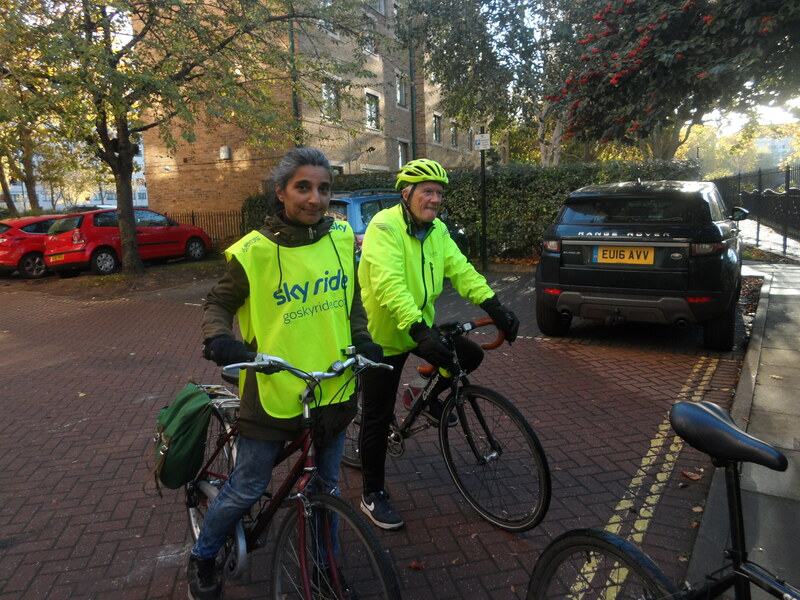 We came out of the park at Stanhope Gate and cycled past Tony Blair’s house, crossed the Edgware Road and headed towards Marylebone and through the Lisson Road Estate onto the Regents Canal back to Regents Park again. We said our farewells and separated at the top of The Broadwalk, James, Chris and Shanaz going east and Malcom and I going northwest back to West Hampstead. Whatever route James plans it always turns out to be a mystery tour. We went through areas I knew well but still found parts I hadn’t seen before. 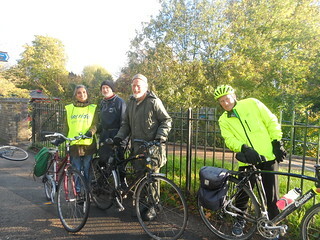 A great day’s cycling in very good company, Thank you all.